New from S&N are these Indexes of the first 42 Registers of Transcribed Wills proved in the Exchequer and Prerogative Courts of York. They're in PDF format. If you have Windows machine the CD auto-runs; Mac user have to find and display the PDF files manually. You get digitally enhanced images of the original text, which can be searched by whole or part name. Alternatively you can navigate by the alphabetic bookmarks. You cannot copy and paste any of the text but you can print whole pages. On the single CD is an 11-volume alphabetic index of individuals who died in Yorkshire with their dates of death and burial, covering the period from 1389 to 1652. The original volumes of which the data is scanned images was prepared by the Yorkshire Archaeological Society and printed in 1905. 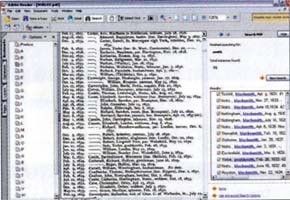 The index includes reference to the register volume and folio in which the individuals are listed, as well as the dates of both probate and the will itself. Apart from that, you also get the individual's name, place of residence and either rank, profession or occupation - no details of the will itself, of course, since this is only an index.